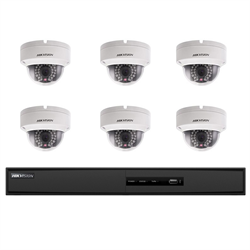 Protect your home, cottage or business with this high definition network security camera kit from Hikvision. Record full colour 1080p video during the day with 6 indoor/outdoor compact dome cameras. Night vision mode allows the for video capture in pitch black up to 30m / 100 feet. Video is recorded to the Hikvision NVR recorder with pre-installed hard drive. Connections require only a single network cable to each camera for both video and power, with power provided by the PoE enabled NVR ports. The cameras automatically configure themselves when plugged in to the NVR so set up is trouble free. Video can be recorded 24/7, on schedule, or on motion with support for analytics such as line crossing and intrusion detection. Live and recorded video can be accessed on the local network using the included free PC CMS software, as well as remotely over the Internet using free iOs and Android apps.